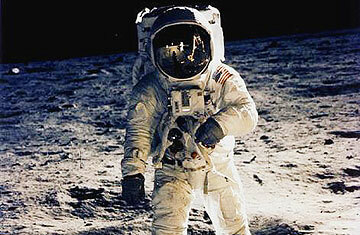 It was one small step for man, one giant leap for mankind, and a lot of people wanted a piece of it. Now, some 40 years after moon dust brought back from the Apollo 11 mission went missing, it was recovered at a St. Louis auction house and returned to the Johnson Space Center in Houston this week. "It's a speck  the size of a fingertip," said David Kols of Regency-Superior auction house, where the dust had been placed for sale. "But it's lunar material, and since we're not going back to the moon in my lifetime or yours, that makes it worth a lot to some people." The U.S. attorney's office in St. Louis, which announced the recovery of the moon dust on June 23, said that investigators with NASA believed the dust had come from the film cartridge of a camera used by astronauts on humanity's first trip to the moon in 1969. The dust was lifted from the cartridge using a 1-in. (2.5 cm) piece of clear tape. Somehow, it reached the black market and was sold in 2001, NASA investigators believe, to a German collector who cut up the tape into tiny slivers rather than return it to the U.S. government. When investigators from both NASA and the U.S. attorney's office noticed moon dust listed for sale in St. Louis, they shut down the transaction with the cooperation of the auction house and the seller. The widow trying to sell the dust  her name was not released  said she didn't know where her late husband had purchased it. She "immediately and graciously agreed to relinquish it back to the American people," the U.S. attorney's office said. The auction house had estimated its value at $1,000 to $1,500. Preliminary testing by the Johnson Space Center's lab has concluded that the material in "all likelihood" is lunar, but final results will take a few weeks. More than 800 lb. (363 kg) of moon rocks, pebbles, sand and dust were ferried back to Earth during the Apollo lunar missions, which ended in late 1972. The overwhelming majority of the material was kept for analysis, but a handful of samples were given to museums, individual states and foreign dignitaries. Some are now unaccounted for, and there are many fakes for sale. A moon rock given to Missouri during the administration of Governor Christopher "Kit" Bond, who was first elected in 1972, was found last year in a box of memorabilia when Bond cleaned out his office after four terms in the U.S. Senate. Bond promptly returned the rock to the current governor, Jay Nixon. The story of the film canister and the stolen dust had been considered a hoax by some, U.S. attorney Rich Callahan said. This discovery, even a little speck, suggests the story is true  though you have to peer really, really close. "The truth is, it's not much to look at," said Callahan. "You have to believe it's there." See photos of the moon's eclipse.